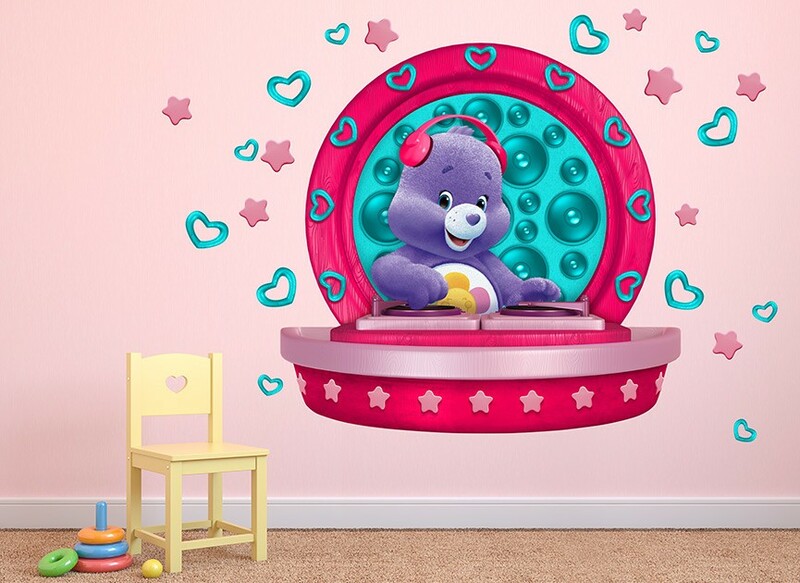 Welcome to TMG: Wall-AH Care Bear Wall Decor! Check It Out! Wall-AH Care Bear Wall Decor! Check It Out! Wall-Ah! That is what you will exclaim when you decorate your child's room with a product that has all the beauty of a hand painted mural with ease of putting up a vinyl sticker. Yes- it is that good. The Wall-Ah company has a wide range of absolutely gorgeous wall stickers that every child- or adult will love! You and your family can choose amongst popular characters, "windows" to other worlds, or my absolute favorite- the CARE BEARS! Yes, you may think I am a bit biased, as it has been known that I am a Care Bear Ambassador (just brush my shoulder right there) but I have been a fan since I could crawl what I would do for one of these bad boys in my room when I was a child. With a variety of different scenery’s your kids can live out my dream with the original Care Bear Crew floating on clouds, or balloons, the Care Bear Cousins (I always loved Lion Heart) also make an appearance on some of the products, and all of them are easily placed into your child’s room making it into a beautiful oasis of fun for their immersive imaginative play! gorgeous. 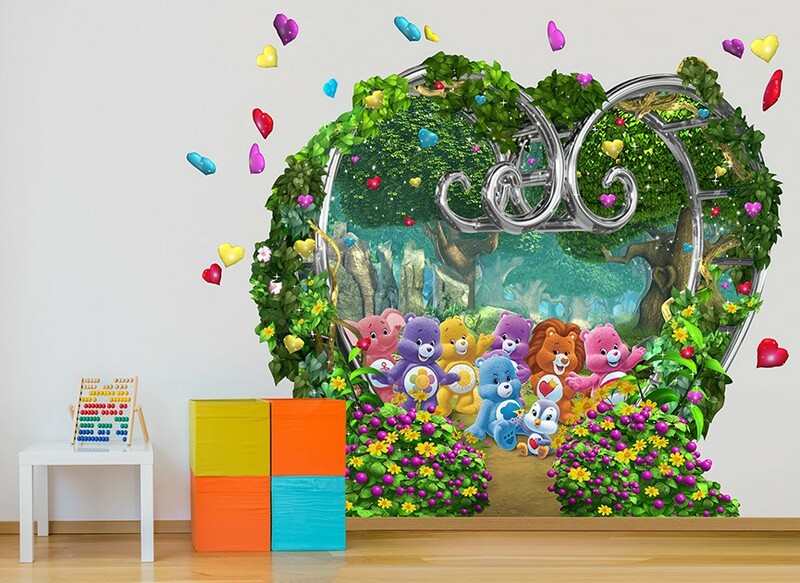 This 51"W x 44"H wall sticker is HUGE with elaborate details that make it look like an actual entrance to play in the Kingdom OF Care-A-Lot with the Care Bears and their cousins. 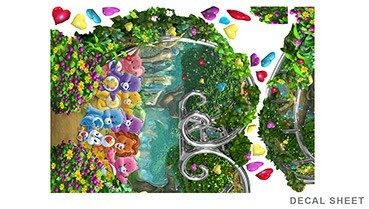 It is essentially a false doorway into their world, with almost realistic flowers and a metal gate surrounding the cartoon world entrance. ALSO it is HUGE! this is the main decorating piece to your child's room and you do not have to do anything but order it, and stick it on the wall! It took us less than a half of an hour to get the vinyl decoration from the paper onto the wall. After we received the product we laid it out overnight just so it would not fold over, then we cleaned the wall of any dust (not that I am saying my house is dusty). Not unlike other Wall stickers you need to make sure the wall is dry, then you start at the top, placing a piece of the wall hanging off the paper and onto the wall, and then pulling the paper off slowly while placing the sticker on the wall. Make sure to flatten any bubbles- although to be honest it did not really have any to flatten- the quality of the sticker was that good! When you get all of the sticker off the paper and on the wall then you are done, add on any pieces that need to be put on surrounding it, or to complete the picture then you are done! The room is transformed and you only need less than a half of an hour and a Wall-Ah wall sticker… Can it get any easier? I think not. it was when it came out of the box. That action right there attests to the quality of the products that come when buying a Wall-Ah product. You see so many of these vinyl stickers that are cheaply made and cheaply priced. When you order those they usually come a lot smaller than depicted in the photos, and have a lasting run of maybe a few months- oh and forget about moving them. Wall-Ah makes a high quality product with a reasonable price tag. The Wall hanging that we were given for review is priced at $119.00 before shipping and it IS worth every penny. The printing is flawless, the sticker is almost silky to the touch, and it turns your child’s room into a wonderland in mere minutes. The only question left is- when are you buying yours! Thanks so much to Wall-Ah and The Care Bears for giving this product for review! As you know we were given this item free of charge- however if we did not love the product you wouldn’t see it on our site!